Austinites are raising a glass for Polio Eradication. Come out and join other Rotarians, Austinites, and concerned citizens to once-and-for-all help eradicate polio. Since 1985 Rotarians worldwide have been united in the efforts to eradicate this deadly disease, and even though it’s no longer present in the USA it still exists in a very few countries around the world. 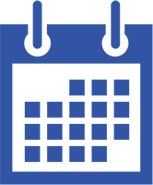 It’s Rotary’s signature “cause”, and we need your help to raise funds to help finish the fight. 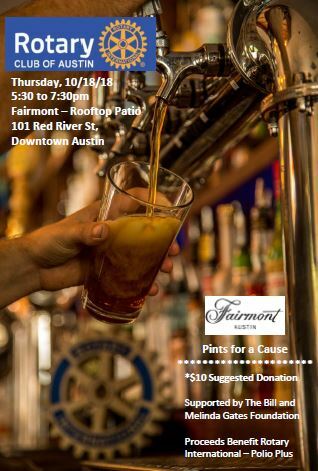 On October 18th, 2018 from 5:30-7:30pm at the Fairmont – Rooftop Patio in downtown Austin, all proceeds from the sale of commemorative glasses, t-shirts, buttons and the beverage(s) of your choice will get matched 2:1 thanks to the generous support of the Bill & Melinda Gates Foundation. That’s right…for every $100 dollars raised it will turn in to $300 of support for global eradication efforts. So get your commemorative pint glass from a Rotarian today or by clicking the Registration Link, come on down (glasses will be available for on-site purchase while supplies last) and enjoy your beverage of choice while meeting other great people and supporting a VERY worthwhile cause! If you’re not able to attend the event, or would just like to make a contribution to support our efforts, please make checks payable to “ARCF” and put “P4P” in the memo field and deliver to the attention of our Executive Director at the Club Office (301 E. 8th St. Austin, TX 78701) no later than November 1st. 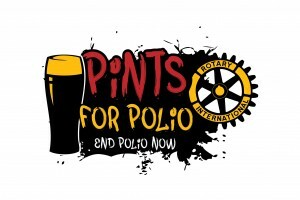 Pints For Polio – Let’s Help End Polio Now!